IT’S 2016 and people still talk about the Internet like it has a mind of its own. Discussions that depict “the digital” as historical agent or, worse, a space unto itself, are a cottage industry. For the art set, these exchanges run the gamut from crowd-pleasing canards about Instagram’s disruption of the art market to full-length books (by Melanie Bühler, Phoebe Stubbs, and most recently Lauren Cornell and Ed Halter) on digital art and its “post-Internet” fate. The New Museum and Rhizome recently joined the fray with their inaugural Open Score, an annual symposium exploring the state of art and technology. The name honors the fiftieth anniversary of an eponymous work from “9 Evenings: Theatre and Engineering,” a flashpoint in Robert Rauschenberg and Billy Klüver’s germinal Experiments in Art and Technology. Art and technology have always been imbricated, but today connectivity is ubiquitous and “software is eating the world,” at least according to one venture capitalist. Four panels packed in a who’s who of digitally inclined theory and practice. New Museum director Lisa Phillips, whose introductory remarks echoed the zero-sum script written by the Silicon Valley architects, cited “the infiltration of the digital into every facet of our lives.” (Such technodeterminism should be taken with a grain of salt. When you’re a cultural institution being crowded out by digital networks, hyperbole is your best friend.) If early art-tech collaborations had the veneer of autonomous experiments, now our network is dripping with politics. We may have jumped into a “democratic space,” but we brought capitalism with us. As Cornell and Halter explain in the introduction to their book Mass Effect, a recent crop of artists is the “first to respond to the Internet not as a new medium, but rather a true mass medium.” Digital networks demand an expansion beyond the medium-specificity to which art practices have long clung. 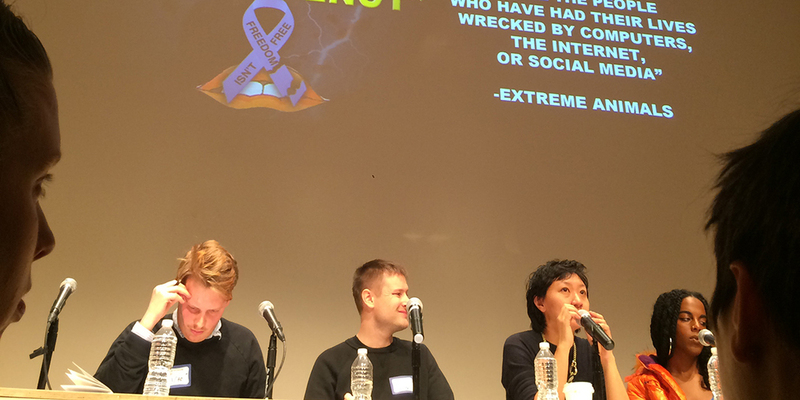 The initial panel, “Generation You,” was moderated by Andrew Durbin and featured artists Simon Denny, Juliana Huxtable, and Jacob Ciocci and poet Cathy Park Hong. How has social media influenced their obligation to self-brand? How do they navigate its pervasive commercial pressures? Ciocci was the first to cast doubt on the habitual and spectacular othering of social media. Technology, he offered, is “anything that organizes or takes apart reality.” It’s nothing new under the sun. Denny spoke next, unapologetically embracing social technologies. He began by recounting his research into the NSA slides leaked by Edward Snowden and how he used networks like LinkedIn and Behance to track down David Darchicourt, the illustrator behind the slides’ infamous “bad design.” For Denny, Darchicourt’s work was sublime, and his installation for the New Zealand pavilion in Venice placed Darchicourt in the Marciana Library alongside Titian and Tintoretto, creating a lineage of representations of the mastery of information from Renaissance humanism to the distributed networks of the present. Poet Andrew Durbin, artist Simon Denny, poet Cathy Park Hong, and artist and poet Juliana Huxtable on “Generation You” at the New Museum. When we reflect on the messy constellation of technologies known as “the Internet,” time is a vector, a trail, a trajectory, and only a partial host for memory. Absent that, it is servers that may or may not be connected. The backlash is in full swing. Huxtable spoke of the difficulty of reconciling her critical relationship to social networks with her feeling that they are “necessary” and “omnipresent.” Huxtable argued that a historicization of the Web’s contents might challenge illusions of its democratic nature. The Google “archive” began at a certain point in time, Huxtable noted: The Internet is not simply an atemporal mass. The panel continually returned to the Internet’s inherent plurality, reacting to its monolithic metaphorical status. Digital platforms may improve accessibility, but how do their designs impact criticism proper? For the second panel, “Liking and Critiquing,” Halter spoke with four practitioners of art criticism (loosely considered). Hypertext is the new normal, and writers must now confront their feudal relationship to platform owners. In the span of a few years we went from “Google is making us stupid” to “Wages for Facebook!” Of course, the administrators of the networks to which we’re beholden—surprise!—didn’t set out to run charities. Some, like Kimberly Drew, who doesn’t consider herself a critic, are less bothered than others. As the founder of Black Contemporary Art, which is hosted by Tumblr and Instagram, Drew remains optimistic about the peculiar forms these platforms have borne. “Why does a listicle have to be such a bad thing?” she asked. This perspective crosses generations. Jerry Saltz claimed he discovered his social-media voice almost by accident from an innocent Facebook comment about a Marlene Dumas show. But now his love of pure opinion and palpable disdain for the “grip of a mandarin jargon that was taught in academia” aligns with the casual many-to-many voice of online discussion. Drew and Saltz have a point: Some days it can seem like the main argument of an expertly composed article could be better handled by the business end of a Facebook thread. For many critics, social media is more agile than the measured claims of a monographic essay, able to host both the polite comments at the opening and the gossip spilled afterward at the nearby bar. But Brian Droitcour and Laura McLean-Ferris wondered about the impact on sustained, rigorous discourse. For McLean-Ferris, the online transparency of an art critic’s “IRL” social ties can make objectivity difficult. New forms of digitally mediated art criticism are merely additive, Droitcour argued. Their voice is closer to speech than text. Droitcour’s perspective is unique: His Yelp reviews of arts institutions exist alongside his contributions to Art in America, where he is an editor. “So much of art criticism is just affirming these power structures that already exist,” which Droitcour says is analogous to how our desire to share our experiences online affirms the existence of massive social platforms. 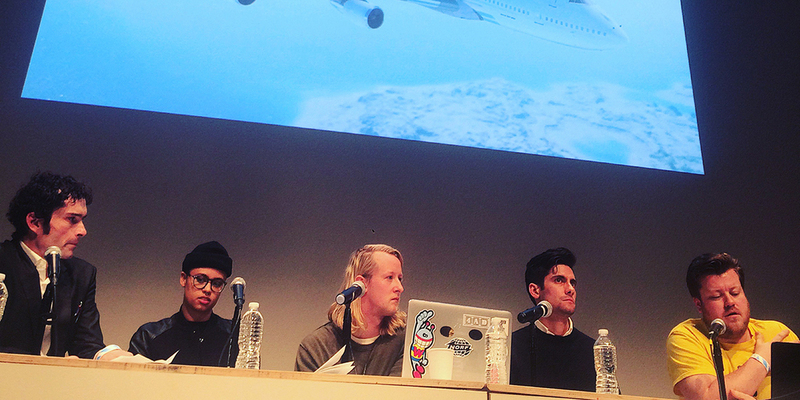 Rhizome artistic director Michael Connor, artists Shawné Michaelain Holloway and Colin Self, Triple Canopy editor Peter Russo, and artist Constant Dullaart on “The Future of Internet Art” at the New Museum. Triple Canopy director Peter Russo considered how his “provisional institution” navigates online power structures: “A minor browser update can debilitate an entire project.” But Triple Canopy’s expensive, artisanally spun custom publication platform isn’t available to all. Most artists use out-of-the-box products. Artist Shawné Michaelain Holloway reflected on her medium’s blank canvas, the empty browser. “This is where I work,” she explained. “Where can I gain power, but also, what kind of powers are imposed upon me?” In spite of certain drawbacks, both Holloway and Colin Self, whose projects use consumer Web products to offer DIY services to an LGBT community, have made these platforms a tool of emancipation. So what happens when humans exchange information faster than ever before? 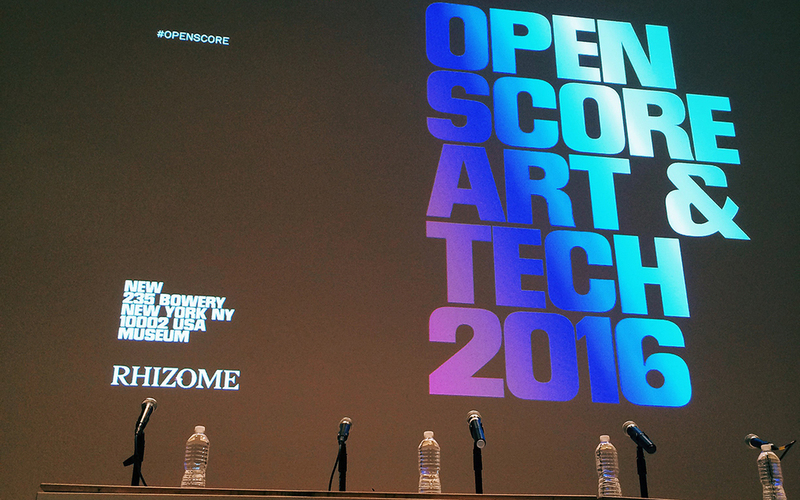 Open Score captured the paradox of digital art practices in 2016: We want to retain the specialness of our virtual materials while acknowledging their ascension of the commercial-media food chain. Thankfully, artists are actively reimagining this bundle of affect we call the Internet, and the rising tide of technodeterminism may now be receding. Just in time, too: Observers have begun to interrogate our narrow frames for Internet culture. In Mass Effect, Cornell and Halter wonder about their book’s usefulness in twenty years: “[W]ill the concept of a specific mode of art engaged with the Internet have, by then, become meaningless?” Perhaps we’re already there.